In spite of heavy short interest from hedge funds, AT&T, Disney, and IBM could deliver solid gains for investors. Based on data from the Goldman Sachs Hedge Fund Trend Monitor report (via zerohedge.com), AT&T (NYSE:T), Walt Disney (NYSE:DIS), and IBM (NYSE:IBM) were hedge funds' three most-shorted stocks in dollar terms at the end of April. Shorting a stock means betting its price will fall. This might seem like cause for concern for investors in these companies, but that's not necessarily the case. Short positions by hedge funds in a particular stock don't mean it will underperform the market. In fact, there is some statistical evidence that heavily shorted stocks tend to do better than the full market over time, which could be because negative sentiment sometimes reaches unreasonable levels, creating buying opportunities for investors willing to make a bullish bet on these companies. With this in mind, let's look at these three companies and try to figure out if these hedge fund managers stand to make money on their short positions or if there are buying opportunities for investors betting the stock prices will go up. Internet and related technologies represent a considerable challenge for telecom companies, and AT&T is no exception. Changing industry dynamics and harsh price competition are making it hard for AT&T to increase sales, and this is dragging on performance. AT&T stock is nearly flat over the last three years, while the S&P 500 index has risen by nearly 65% over the same period. It's not all bad news for investors in AT&T, though. According to data from Cisco's Visual Networking Index, global mobile data traffic will increase nearly tenfold from 2014 to 2019. This expanding market could provide plenty of opportunities for AT&T to jump-start growth. When it comes to Disney, the only argument I see for a bearish position is its demanding valuation. Disney stock carries a price-to-earnings ratio of nearly 24, which represents a premium versus an average P/E ratio in the neighborhood of 19 for companies in the S&P 500 index. On the other hand, that's hardly enough reason to justify a short position in Disney. The company is the top player in the global entertainment industry: Disney owns an enormously valuable gallery of brands and properties that sets it apart from the competition, and management knows how to translate those strengths into rock-solid financial performance. Furthermore, the company has many exciting projects in its pipeline, including Star Wars: The Force Awakens, which is scheduled to be released in December and could be a major blockbuster. 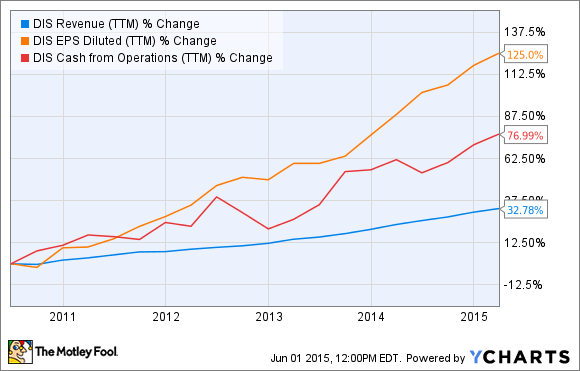 Like AT&T, IBM has been delivering disappointing revenue growth. The company is selling its operations in hardware-related businesses to better focus on more promising opportunities in software and services. Also, new industry trends such as cloud computing and the rise of software-as-a-service are forcing IBM to adapt to new business models. Revenue growth from the strategic imperatives group of businesses has been in the neighborhood of 20% on a currency-adjusted basis in each of the past five years, and growth even accelerated to 30% year over year in the first quarter of 2015. Management believes these segments can generate $40 billion, or about 40% of the company's revenue, by 2018. If IBM can deliver, this could be a big positive in terms of overall financial performance.